Is This Annoying Sound Familiar to you? We can help with wind induced railing noise. Our products reduce the railings ability to create noise and vibration solving your balcony railing noise problem. Foam Filling your rails is a great permanent solution to the railing noise problem. 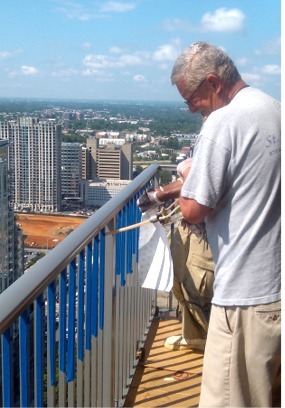 It requires a site visit by our trained technicians, where we inject the Foam into your railing. We use our own proprietary equipment (patent pending) to inject the foam into your railings. We use a closed cell polyurethane rigid expanding foam which is injected into the pickets of your railing. This forms a permanent bond and increases the stiffness and rigidity of the pickets. It has the added benefit of eliminating voids thereby reducing the sound generating characteristics of the pickets & it strengthens the pickets. A couple of excellent analogies are: Imagine a guitar where the body is filled with foam - not going to get much music from that, or think about blowing across the top of an empty bottle and getting the "whoo.. whoo.." sound, fill the bottle and the sound goes away. We take particular care to protect your Balcony, from damage, our technicians will protect the floor as well as the railings during the foaming process. Foam filling can be awful messy if you're not carefull! this is a great picture of a foamed picket cut in half. Get a good nights sleep! For around the cost of a cup of Coffee and a Danish a day you can quiet your balcony railings, and it will keep working year after year after year! Call us for a quote. This is a permanent and unobtrusive solution to the railing noise. This is perfect for high end Apartments that don't want the visible detractions of a Quick Zip Quiet Bar, Desire a maintenance free installation, or have small children and are concerned with a ladder affect. Please visit our Order Page to get a quick response and pricing. FoamFilled.com "Your Source for Peace and Quiet"